When going for shooting practice or hunting; especially if you are trying to hone your sharpshooting skills, it is always a smart idea to use the best tactical scopes for your rifle. It greatly improves your aim and precision. The scope has many improvements over the classic iron sight. As the iron sight is used to focus on target by alignment of the front and rear sight relying only on your eyesight, hitting the desired target is something that is sometimes difficult to accurately do. The telescopic sight, or as by its common name – the scope, is a sighting device that is based on the principle of an optical refracting telescope, making the use of the iron sight obsolete. The use of this kind of device on your rifle greatly increases your targeting skills. The scope facilitates the focusing by aligning the crosshair and the desired target at the same time, thus making the whole targeting process more efficient. 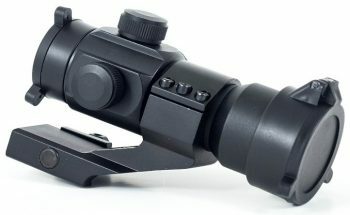 The top tactical scopes today have many various designs and features, which make them very useful when going shooting. All scopes today are equipped with telescopic magnification, which makes the target easier to see against the background. Many of you may be closely familiar with the types and features of a tactical scope, but for the rest of our readers, here are the basic features that can be found on a tactical scope. The scope is defined by optical magnification and objective lens diameter. The fixed magnification scope is such where the primary lens is fixed, and there is no fine adjustment to the magnification. This results in a clearer image and lighter overall weight of the scope. The variable magnification scope operates with a zoom mechanism. 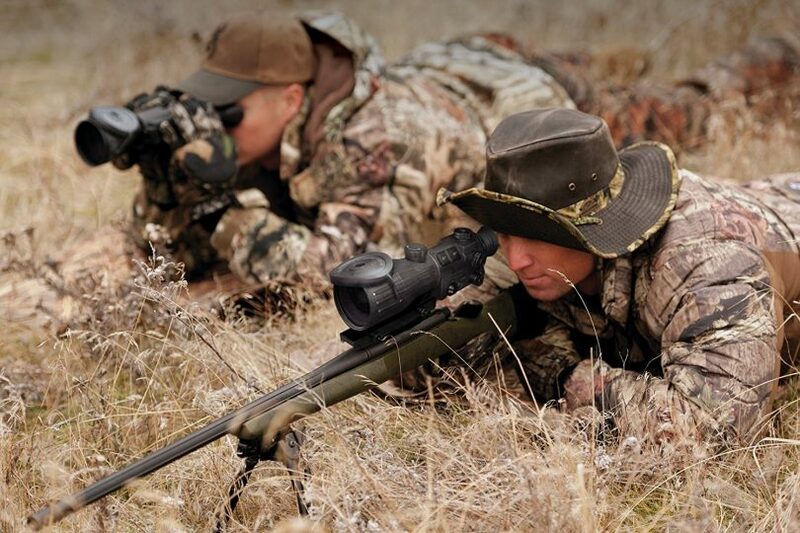 The variable magnification scopes are more flexible when shooting at various targets, ranges and light conditions. You should know the intended use of the scope so you can better choose the type best suited for you. How much larger the image was seen is. For example, a scope with a magnification power of 7 will produce an image that is seven times magnified. The magnification power should be chosen wisely based on the intended use of the scope. The lower magnification means a steadier, wider image: the higher magnification means a narrower field of view and a clearer image. The diameter expressed in millimeters of the front lens of the scope, determining how much light the scope can gather. The larger diameter means more light gathered and a brighter image. The result of dividing the objective lens diameter and the magnification power. The exit pupil determines how bright the image can be seen; the closer the exit pupil to the size of the human eye pupil results in no light waste and the image can be quickly found and the target can be easily tracked. This is a measurement that describes how wide the produced image is; in linear value: how many feet will be seen at a given length (feet at 100 yards, or meters at 100m). In angular value, this means how many degrees can be seen. The distance from the rear eyepiece lens and the exit pupil. This is the distance where the viewer must position the eye in order to see the whole image. The longer focal point of the eyepiece means the greater eye relief. This dimension is very important when looking for tactical scopes because the tactical weapons tend to have recoil which may result in facial and eye injuries if the eye relief is very short. This is also important for people who wear eyeglasses; the longer eye relief means that one can easier see the whole field of view without removing the glasses. The main tube of the scope is where all the important stuff is located. It is important for this to be sturdily made, and to have an appropriate diameter and not interfere with the weight and handling of your weapon. When looking for a tactical sight, you will notice a lot of possibilities regarding the reticules ranging from simple crosshairs to complex reticules with various details in them. 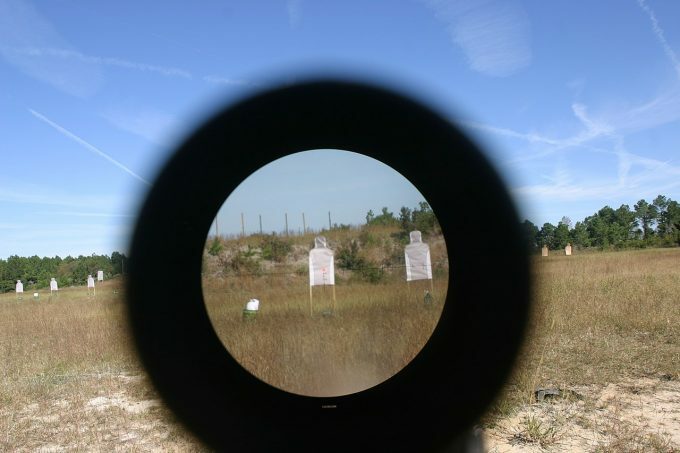 The choice of reticle should be made based on the intended use of the scope. 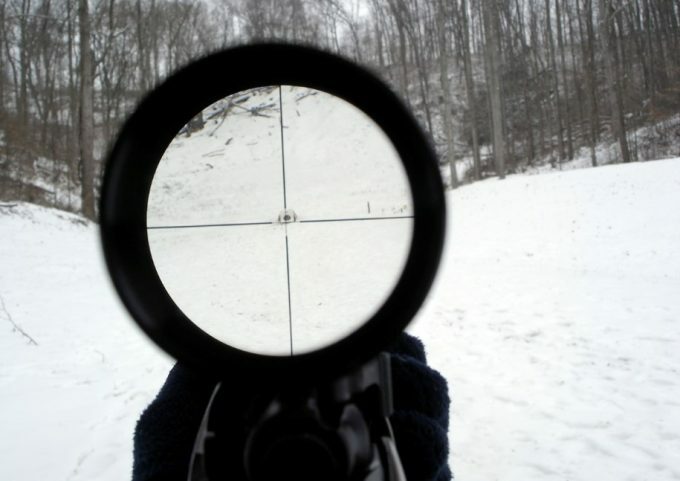 The reticle of a scope can be illuminated in order to better see it in low light conditions or when shooting at night. Many high-quality tactical scopes have illuminated reticles where the brightness can be adjusted in order to prevent eye fatigue and glare. The most common color of illumination is red. A feature where the scope has a correction for possible parallax induced aiming errors. Parallax is the displacement in the position of the viewed object along two different lines of sight. 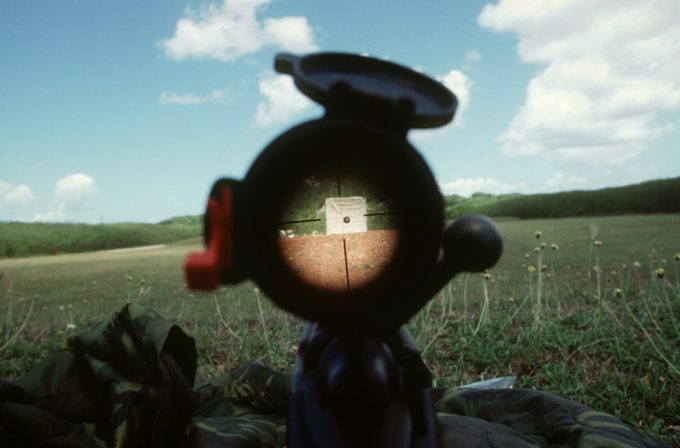 Many scopes have the parallax compensation mechanism that ensures that the viewed object and the reticle crosshairs are in the same optical plane. A feature found on many tactical riflescopes. This feature compensates the effect of gravity on the bullet at given distances. This feature must be tuned for specific trajectory and the particular combination of weapon and conditions of use. All the tactical scopes on the market today have several adjustment controls like focus control, elevation (vertical adjustment), windage (horizontal adjustment), magnification control, illumination adjustment, and parallax compensation adjustment. Many scopes today are sold with additional accessories that make the use and safekeeping of the scope easier. Some of these are: lens hoods, lens covers, optical filters, kill flash filters, eye – safe laser filters, carrying cases and cleaning cloths. Few weapons come with factory equipped sights, so additional equipment is necessary to properly mount the scope to the rifle. Most scopes come with a mounting base and mounting rings, and you need to choose the correct combination to fit your weapon. These can be Weaver style rail mounts, dovetail type or Picatinny rails that can be mounted on most weapons and the desired scope mounted on them with the help of the appropriate scope rings (based on the diameter of the scope). Above we have addressed all the features you need to know when looking for your next tactical scope. Before you make the final decision on which tactical scope to buy, we have some reviews prepared for you. So, keep reading along and always have the intended use and available budget in mind. Description: The Lirisy Rifle Scope is a very versatile gadget to have at your disposal. It has high grade fully coated optic lenses with a 50mm objective lens diameter for maximum light gathering for a clear, light image. 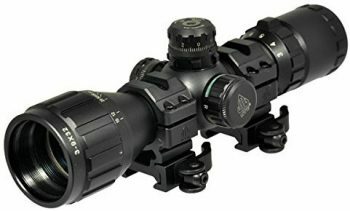 This scope has the variable magnification power of 4x to 12x that is appropriately suited for wide range shooting and hunting. The scope has 5 levels of illumination with both red and green option available; has an eye relief of 3.4 inches, and an exit pupil size of 3.3 – 10mm making it relatively versatile and safe to use. The holographic red and green dot sight has four reticle patterns and sits atop the 50mm scope. It has no magnification and objective lens diameter of 22mm. The scope is equipped with red laser reaching the distance of about 110 yards. It is class IIIA laser, with maximum power output of <5mw. Its housing is made from aluminum. The Lirisy tactical rifle scope has elevation adjustment and windage adjustment knobs. The body of this scope is made from aluminum, sturdily constructed, waterproof, shockproof, fog proof, and snow and dust proof. It comes with its own 22mm rail mount that fits any Picatinny rail. In the box along with the Lirisy rifle scope, the holographic sight, and the compact laser sight, there are also three Allen keys for rail mounting and adjustment, lens caps, cleaning cloth and 2 CR2023 batteries and 3 AG13 batteries. Related: When considering getting the Lirisy riflescope, you should consider getting a tactical rifle bipod (if you already don’t have one that is). Our recommendation is that you get the CVLIFE 6 – 9 Inches Tactical Rifle Bipod. Also, an interesting investment would be a rifle sling, such as the Accmor 2 point Rifle Sling. Description: The UTG BugBuster Scope is readily available and useful addition to your arsenal. It features emerald coated lenses for maximum light transmission, allowing for a clear, crisp image. This scope is completely sealed from the elements and is filled with nitrogen to ensure a fog-free performance. 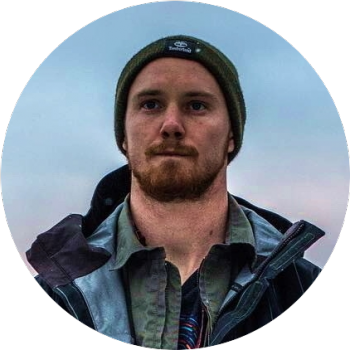 Built on the True Strength platform, the scope provides long lasting reliability and guarantees precise and responsive windage and elevation adjustments. This technology has been tested and proved against the hardest scope – killing air guns and extreme recoil rifles. 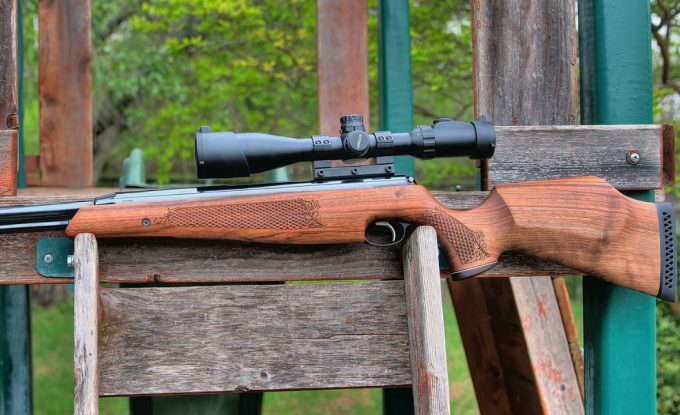 All the adjustment knobs are locking and re – setting to ensure proper zeroing on the desired target. The scope has parallax compensation mechanism in the form of an adjustable objective, and you get a parallax-free view from 3 yards to infinity. The UTG BugBuster Riflescope has an RGB side wheel illumination, avoiding the need for a bulky rheostat on the eyepiece and allowing for quick and easy access to the reticule light. An interesting feature found on this scope is the Mil – dot reticule. This is a Leapers innovative design – the range estimating concept enables shooters to enhance accuracy and performance. The Leapers/UTG Mil – dot reticule has 9 dots in each direction of the crosshair allowing for 19 aiming points and this significantly facilitates the precision in aiming. The scope comes equipped with flip – open lenses, 2-inch sunshade, and Max Strength heavy duty mounting rings that fit Picatinny/Weaver rail and have the fully adjustable quick detach lever locks. 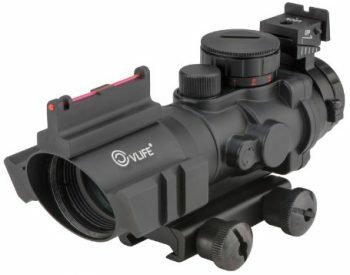 Related: If you are considering getting the UTG BugBuster Riflescope, the ad you already don’t have a rifle stand, we recommend that you get the CVLIFE 6 – 9 Inch Tactical Rifle. This stand has adjustable, spring loaded legs, and easily attaches/detaches from the rifle thru a swivel stud. Description: The Aipa AR15 Rifle Scope has some interesting qualities to itself. 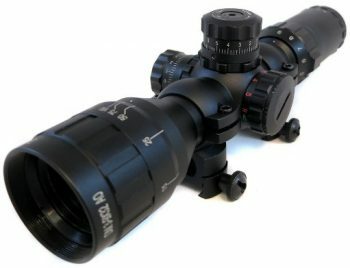 It features clear high quality fully multi-coated optics, with a magnification power of 4x – 12x and an objective lens diameter of 50mm, making this scope very bright. It has red and green illumination, with five levels of brightness control for comfortable viewing in various lighting conditions. The eye relief on this scope is 3.4 inches, and the exit pupil size is 10mm. The scope also features a laser IIIA class that has a distance of 110 yards. This is a detachable feature, and you can use it with or without the laser, or you can install another feature like a flashlight instead. The Aipa Rifle Scope has a 4 reticule holographic red and green dot sight with four reticle patterns and five levels of brightness control. The body is sturdy made and is waterproof, fog proof and shock proof. It comes with a mounting clip that fits Weaver/Picatinny style rails. Related: People that bought this scope, also recommend that you look into getting a tactical rifle bipod stand (assuming that you do not own one yet). You can look into getting the CVLIFE 6 – 9-inch Tactical Rifle Bipod Adjustable Stand, as it is very versatile and easy to use. Description: The Rhino Tactical Sight is designed to be used in tough conditions. It offers the choice between a green and a red dot with five levels of brightness, and it fits well on your weapon. 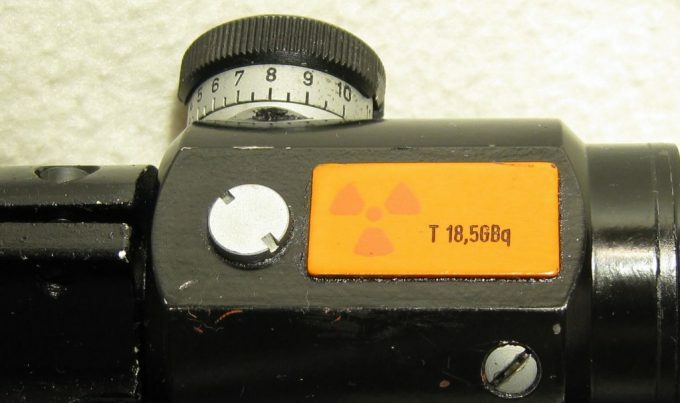 The lens is Iron Sights Coated with 35mm lens diameter. It easily fits any standard AR pattern, and with its 4 MOA dot, it is perfect for target acquiring. The optics is protected by flip – caps on both sides and it has very good eye relief. It comes in black matte finish for nice blending with your weapon. It is also available with a Picatinny Cantilever mount. Overall this is a good beginner’s choice. The battery is CR2032 that is included in the package, and it comes with a 1-year full warranty. Related: Together with the Rhino Tactical Green/Red Dot sight, people also recommend that you get the CVLIFE 6-9 inch Tactical Rifle Bipod Stand, assuming you don’t have one. The bipod stand is an interesting addition to your gear, as it offers the adjustable height of the legs, is well made and not so heavy to carry with you. The rifle is attached and detached with an existing swivel stud and a mount adapter. Description: The WhaleStone AR15 Scope is a versatile gadget to have in one’s arsenal. It features high-quality optics, with the fully coated optical lens. It has magnification power from 3x to 9x, and a wide 40mm objective lens diameter. The body of the scope is made completely of metal and it is weather and shock proof. 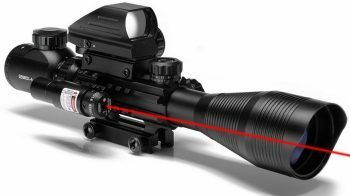 The riflescope has five levels of brightness for both green and red illumination. The reticule is rangefinder style; the exit pupil size is 13.3mm, the eye relief is 2.7 – 3.5 inches. There are knobs for adjusting of the windage and elevation with a click value of ¼’ at 100 yards. The scope is powered by one CR2032 battery. 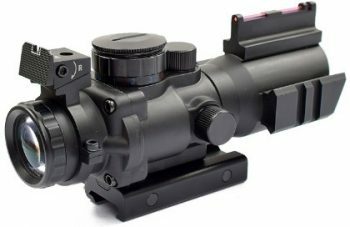 The holographic red dot sight is mounted on the side of the scope, has unlimited eye relief, and has five levels of brightness for both red and green dots. It is powered by a single CR2032 battery. Each part of the scope can be used as a standalone, and the scope can also be used without illumination. The red laser sight is mounted on top of the scope, is a class IIIA laser, with its own power switch and adjustable for both windage and elevation. Included in the package are theC3-9X40EG Riflescope, HD22M1-RG holographic red dot sight, Red laser sight, two Allen keys, lens caps, cleaning cloth, manual, and the necessary batteries. Related: In tactical situations, it is a good idea to have a quality sling on your rifle. One of the bests that we’ve come across is the Accmor 2 Point Rifle Sling. The OTW Rifle Scope is an interesting gadget to have at your disposal. This is a relatively inexpensive option, and it features Picatinny rails on both so you can mount a laser or a flashlight to it. The scope has a magnification power of 4x, and objective lens diameter of 32mm. The exit pupil size is 8mm, and the eye relief is 89 mm (3.5 inches) to protect your eye from possible recoil. 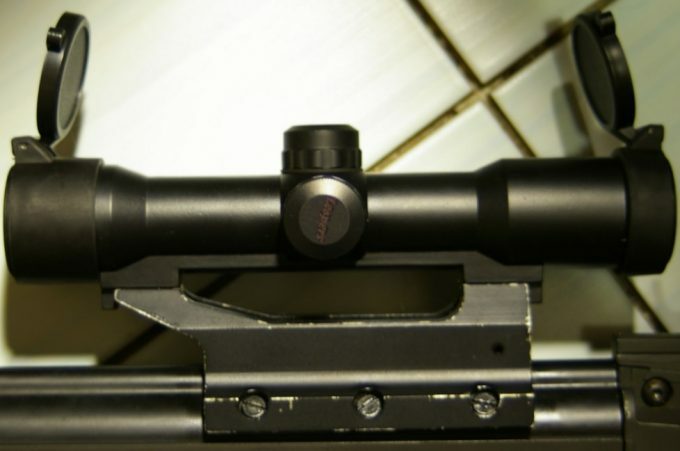 The scope has illuminated red – green – blue rapid range glass etched reticle with 9 different settings. The OTW Riflescope is equipped with state of the art Fiber Optics sight for rapid and accurate acquisition. The windage and elevation adjustment knobs feature ball bearings for precision and longevity. The body is made from aluminum and is 100% shock and recoil resistant, it is filled with nitrogen for fog proof performance and sealed against the elements. Related: As this scope features Picatinny rails right on the scope you have the option of mounting any number of other accessories. One great option would be to add a light and laser combo, such as the Tactical Laser AN/PEQ-15. Description: The Monstrum Tactical Rifle Scope is a decent gadget to have. 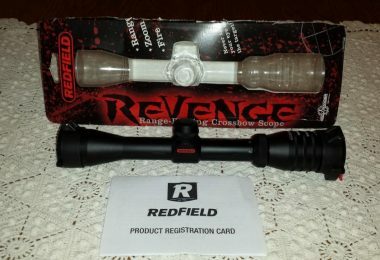 It is full featured scope well suited for tactical use, hunting, and target practice. It features adjustable 3x – 9x magnification, with a 32mm objective lens diameter. 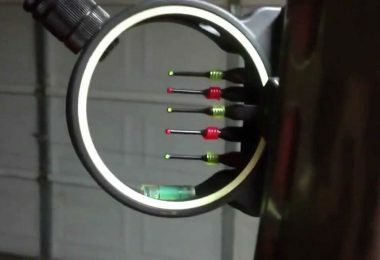 The scope has the choice between red and green illumination with five levels of brightness for better visibility in the daylight of at night. The objective lens is adjustable – AO – for the elimination of parallax, range estimation and a sharper focus on the desired target. The windage and elevation adjustment dials have locking turrets and ¼ MOA per click. The reticule has rangefinder design, making it easier to estimate the range and compensate for bullet drop. The body is made from lightweight aluminum for durable performance. It is nitrogen filled for fog proof performance and sealed against water. The Monstrum Tactical Riflescope uses the single 3V CR2032 battery and comes with protective lens caps. Also included in the package are a set of mounting rings that fit any flat top Picatinny or Weaver rail. Related: If you already don’t have a rifle stand, it is recommended that you get one for yourself. Such as the CVLIFE 6 – 9-inch Tactical Rifle Bipod Stand, easy to use and easy to carry with you. Made from aluminum, it is sturdy and fits all rifles with easy mount swivel stud. Description: The CVLIFE Tactical Rifle Scope is a versatile small gadget to have at ones’ disposal. It has the magnification power of 4x, with an objective lens diameter of 32 mm; the exit pupil size is 8mm, and the eye relief is about 2.5 inches. 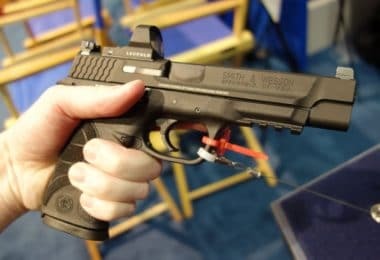 The shooter has the choice between three color illumination – red, green and blue – each with three levels of brightness for adjusting to the needed brightness. The lens has green multi – coating for bright and clear image. The scope is equipped with fiber optics sight for quick target acquisition; and has pre – set parallax adjusted for 100 yards. The scope has side Weaver rails for adding accessories like laser or flashlight. The body is made from aluminum for lightweight performance, fog proof, waterproof, shock resistant and recoil resistant. It comes in black matte finish, and also included in the box are a lithium CR2032 battery, 3 Allen keys for setup and adjustment and a cleaning cloth. Related: When considering upgrading your shooting accessories, it is always smart to invest in a bipod stand. One such recommendation is the CVLIFE 6 – 9-inch Tactical Rifle Bipod. This stand is easy to use, made from steel and aluminum it easily fits your rifle with the existing swivel stud. Another interesting purchase is the laser bore sight for checking if your rifle is still zeroed in after prolonged use and after packaging and travel. A recommendation is the ELENKER CAL 223REM Gauge Laser Bore Sight. We have done our job and reviewed in detail some the best tactical scopes at an affordable price on the market today. Now it is up to you to make an informed decision. We hope that our review helps you with choosing the best tactical scope that will fit your needs and budget. Also, do not forget to tell us about your choice and share your experiences in the comment section below.